This article from the 1938 October issue of Sword & Shield reports that Tom Harmon '41 played a key role in helping PDT win the 1937-1938 All-Sports IM Championship for the U of M Fraternity League. 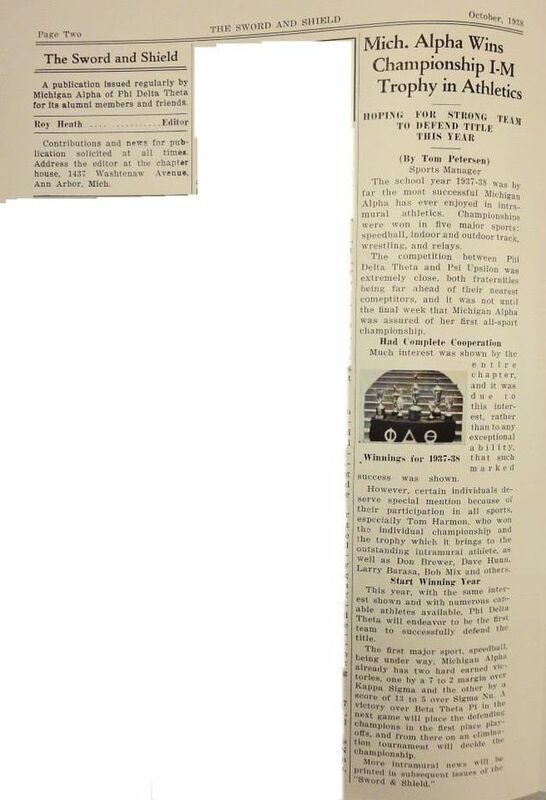 U of M named Harmon the top individual IM athlete of the 1937-1938 school year. This article shows that Harmon was not just a Phi in name; rather, he was actively involved in the fraternity. Apparently Harmon was able to play for PDT because it was the practice at the time for freshmen not to play on the varsity football team -- he played on the all-freshman team. To put this in perspective, imagine having freshman Denard Robinson on your IM team at U of M?